We had an excellent Q&A last week with the student and adcom representatives from London Business School. Please read the excerpt below for a sample of what was discussed, and then download the full transcript or listen to the audio file for the full conversation. Linda Abraham: How do teams work? Could you share more insight about the study group experience for a student at LBS? Finnbar Cornwall: So the makeup in my study group is really fascinating. In my study there are six of us in the – for those that don’t know just to start from the outset, there’s 400 in our year. We’re split into five streams of about 80, and then within your stream you are in a study group of six people, sometimes seven. So, my study group is me, there’s an Egyptian girl who worked in marketing for American Express in New York. We have a Chinese guy, former banker, and then he worked in clean tech in business development and clean tech in China, an Italian-Japanese consultant from Italy, an Australian consultant, and an Israeli girl who was formerly in the army and then a journalist. So, that is my study group and that sort of diversity that you can see there is just reflected across my stream of 80 people, and then again across the year of 400. And really one of the most interesting parts of being at LBS is you get a group project…and getting a range of views, seeing the consultant’s comment, to then a banker’s view, and then the sort of marketer…It’s really interesting, very fascinating. And then beyond that within the stream of 80 people we can get some very interesting discussions going within class. If we’re looking at a particular topic somebody, has more than likely been involved in that…and has a perspective when we’re talking about…. So that’s definitely been one of the pluses and it’s one of the reasons why I picked LBS, …is the range of experience that people bring…The average years of experience is slightly more than in some other programs, and you really feel that. You get the benefits of that, sort of the diversity and the range of people. Alina Vivian: I’m actually in a group of seven. There are not very many groups of seven. And I’m the only native English speaker in my group. There are five guys and one other girl. One of the guys is from Brazil, and he used to work in finance and consulting. There is another guy originally from Nigeria, and he was previously working for Shell as an engineer, so industry. There’s another guy working in Kuwait, or he’s from Kuwait, and he is an economist. And then, there’s another guy working in consulting in the Netherlands, and another guy who is working for his family business in India, and his family business is actually traded on the public exchange in India. And then the last person in my group is another girl from Russia. She has a PhD in finance, so again, it’s a quite diverse group, but we actually get along really, really well. 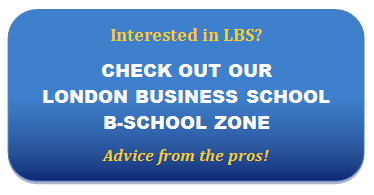 Read the rest of the transcript or listen to the MP3 audio file and visit the London Business School zone page for more information on how to create a winning application for this top European b-school! To automatically receive notices about these MBA admissions chats and other MBA admissions events, please subscribe to our MBA events list. 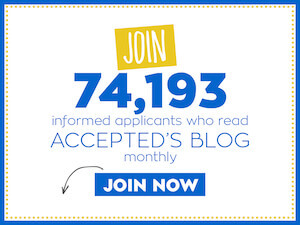 To listen to the Q&A recordings on-the-go, please subscribe to the Accepted Admissions Podcast. Last updated on February 26, 2015.